Ponagar Cham Tower (Tháp Chàm Ponagar or Tháp Bà Ponagar) was built in the period from the 8th century to the 13th century. It is a representative of Cham’s art, architecture, and culture, and is also a popular tourist destination in Nha Trang city, Khanh Hoa (Khánh Hòa) province, Vietnam (Việt Nam). 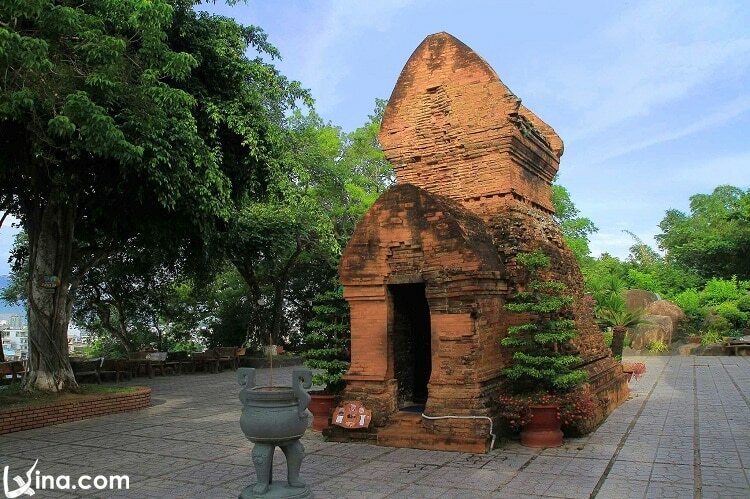 Ponagar is a Cham temple located on a small hill next to the National Highway 1A (Quốc Lộ 1A) in Vinh Phuoc (Vĩnh Phước) Ward, north of Nha Trang City, Khanh Hoa Province. Although it is called the Po Nagar Cham Tower, it is actually the name of the largest tower in this architectural complex. Ponagar Cham Towers were built during the Hindu period in the ancient Champa Kingdom (Vương Quốc Chăm pa). It is located on a hill, which is 50 meters above the sea level, and in the estuary of the Cai river door. These Cham towers were used by Cham, Chinese and Vietnamese monks to worship. The lowest floor: it is ground floor, but today there is no path to the middle floor from the lowest floor. The middle floor: It is Mandapa (living room) for customers to rest or prepare to celebrate.This floor is 20m high, 15m wide, including 4 octagonal columns (10 large columns and 12 small columns). On large columns, there are carved parts and symmetrical with the tops of the small columns. The top floor: The place is built in Cham’s style. The bricks are tied together with a binder that we cannot see. 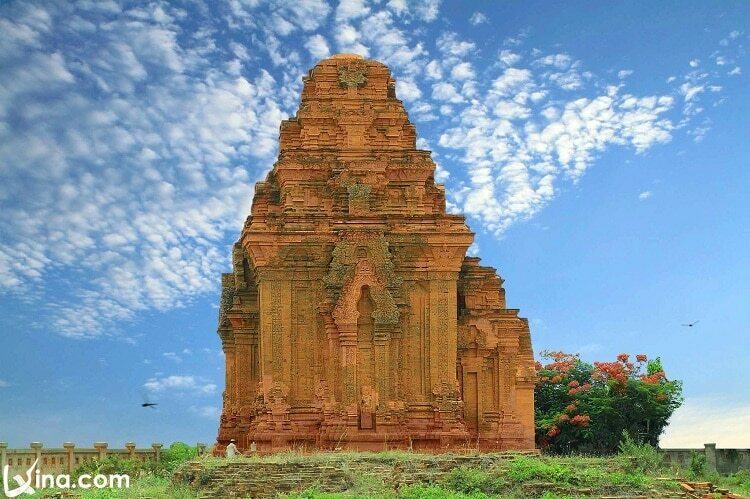 Historically, Cham was an ancient civilization that really influenced Southeast Asia, especially in Vietnam and Cambodia. The Cham ruled Vietnam for 10 centuries, so their architecture and art have spread throughout the country.They are said to have the roots from Indian Buddhism. Thus, there are many similarities between Angkor Watt and Ponagar Tower in Nha Trang. At the present, the towers just have a few differences in compared with the original design (except the Golden Dome was stolen by pirates). Four Ponagar Cham Towers today are truly beautiful and charming. Each of them was built to offer a unique deity. The largest tower is 23 meters high and has 4 floors. Each floor has doors, statues, and animals with interesting motifs. At each floor’s four corners, there are four smaller towers. It contains a heart and a statue dedicated to Ponagar, who is said to have taught new agricultural and weaving techniques to local people. With gratitude, they built the complex to honor the goddess. There is a statue of goddess sitting on a lotus stone pedestal inside the tower. It is 2.6m high and carved in black granite. At the top of the tower, there is a statue of the god Shiva riding the god Nandin and statues of mascots like goats, birds and elephants. In addition, the tower facade is decorated with stone sculptures describing the shapes of dancers, rice millers or hunters with bow and arrows. The east door leads into a side corridor, with two stone statues depicting goddess Durga dancing between two musicians. Inside the tower, space is quite dark. The last part of the tower has a stone statue of Mrs. Po Nagar with ten arms. Two main hands are placed on the knees while the other hands hold the objects like a plate, a bow, and an olive tree, etc. These mascots symbolize the boundless of the goodness. Other temples worship Shiva (one of the three supreme deities of Hinduism), Sanhaka, and Ganeca (according to the, legend he was the son of Shiva). The central tower is dedicated to Cri Cambhu, who is an incarnation of Shiva and blesses the devotees with fertility. The Northwest Tower is dedicated to Sanhaka, a woodcutter and foster father for Ponagar. The tower in the south was dedicated to Ganeca, Ponagar’s daughter. The southeast tower worships Skanda who is the son of Shiva and symbolizes the war. If you enjoy history, you may be surprised to see hundreds of ancient relics displayed inside this complex. If you like to take photos, the posters at the tower stand have a great view of the Cai river (sông Cái) door and the riverside village. If you want to explore the hidden charm of the Cham culture, you can watch many traditional dance shows as you wish. Remember that this site has a religious significance, so you should remove the shoes and wear properly respectful clothes prior to entering. The entrance fee is only about 1 dollar. The site is open from 7 AM to 7 PM. You can easily access to the site if you go by car and motorbike. What To Do In Ponagar Cham Tower? Every year, the festival at the Ponagar Cham Tower is held from 21st to 23rd March of the Lunar Calendar (around the end of April and the beginning of May). At that time, many traditional Cham activities will be conducted and people will gather to honor their goddess. 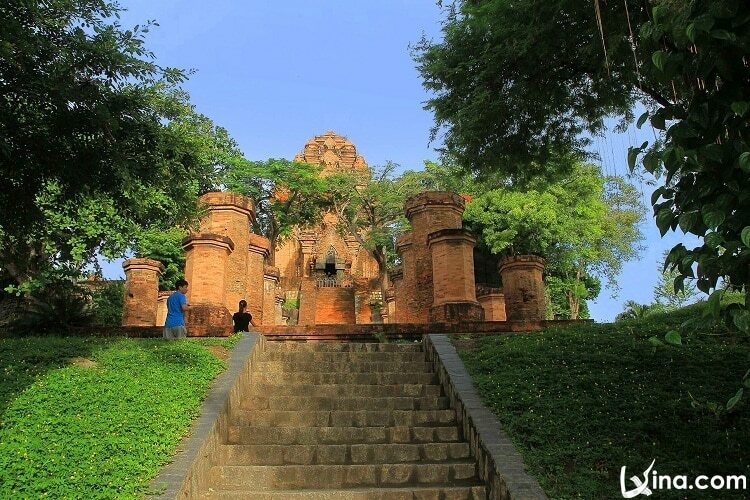 Tourists visiting Nha Trang in the festive season will feel the interesting atmosphere of local people, understand special culture of the Cham people, and have a chance to discover the mystery of Ponagar Cham Tower which was a symbol of an ancient kingdom. Besides, travelers can also relax with mud bath right at the tourism area of Ponagar Cham Tower, which is not only relaxing but also good for health. The above is general information about Ponagar Cham Tower. Hope that our entry can help you plan your trip to Nha Trang, in general, and Ponagar Cham Tower, in particular, more enjoyably. If you have any questions, leave a comment below, and we will respond as soon as possible.